Original text and images of the 1988 BMX Schwinn sales brochure. Schwinn's Robert Peterson master of balance - "One serious stylin' machine!" Frame - Patented Schwinn, 4130 oval. Chrome moly freestyle design with step 1 top tube platform. Step 2 rear integral platform and Step 3 down tube platform. Fork - Schwinn 4130 chrome moly with integral fork peg studs. Handlebar - Patented Schwinn, low rider 4130 chrome moly freestyle design. Grip - Yo! grip this. Stem - Yo! stem, potts modification and new ACS rotor mechanism. Brakes - Dia compe FS 883 front and Yo! U brake rear, dia compe tech 6 levers with parking brake and lined casing. Crank - SR Cr Mo lite, with predator logo, 175mm, chrome moly with sugino alloy diamond cut compact disc, 431. Sprocket - SunTour ez off 16T. Pedals - Roller design with chrome moly axle. Rims/hubs - Yo! 48's Araya 7x 20" x 1.75". 48H Alloy/Yo! 48H, LH alloy hubs with chrome moly axle. Tires - Yo! tire 20" x 1.75" unique low rolling, resistance, freestlye, engineered. Saddle - Patented Yo! Rock n' Roll delux, roller and handle design. Seat Post - Schwinn fluted, chrome moly, painted. Seat Post Clamp - Alloy with allen head bolt. Color finish - Black chrome or neon blue with chrome plated rear triangle, step 1, step 3 platforms PFP. Frame - Patented Schwinn, 4130 chrome moly, freestyle design with step 2 integral rear platform and stem 3 down tube platform. Handlebar - Patented Schwinn, low rider, freestyle design, painted. Grip - Yo! grip tires. Brakes - Yo! FS 2001 front and Yo! U-brake rear with tech 6 levers and lined casing. Crank - Chrome moly 175 mm with 43T Freestyle disc sprocket and predator design logo. Sprocket - SunTour EZ -off, 16T. Pedals - Plastic beartrap with chrome moly axle. Rims/Hubs - Predator Zytel mags, 20" x 1.75"
Tires - Yo! tire 20" x 1.75" unique low rolling resistance, freestyle engineered. Saddle - Yo! Rock n' Roll delux roller and handle design. Seat post - Schwinn, fluted, chrome moly painted. Frame - Patentented Schwinn, 4130 Bi-oval Chrome moly, freestyle design. Handlebar - Schwinn low rider, freestyle design. Stem - ACS potts modification and new rotor mechanism. Brakes - Yo! FS 2001 front, MX750 rear with tech 4 levers and lined casing. Crank - Heat treated 175mm with 43T freestyle disck sprocket and art design. Pedals - Plastic platform with chrome moly axle. Rims/Hubs - Alloy 7x type, 20" x 1.75" 48H/SF 48H painted. Tires - Freestyle design 20" x 1.75". Seat post - Steel, chrome plated. Frame - Schwinn, hi-ten steel. Fork - Schwinn Hi-ten steel. Handlebar - Schwinn mini profile. Stem - MX 550 alloy with chrome moly shaft. Brakes - SunTour coaster brake. Crank - Heat treated 6 1/2" with 43T freestyle disc sprocket. Rims/Hubs - Predator zytel mag 20" x 1.75" with SunTour coaster brake and hub. Tires - Freestyle 20" x 1.75". Seat post clamp - Steel, chrome plated. Color Finish - Black with white fork PFM. Handlebar - Schwinn mini low profile design. Brakes - Chang star MX 890A front and MX 1000A rear with tech 4 levers and lined casing. Crank - Steel 6 1/2" with 43T disc sprocket. Rims/Hubs - CMC 7x type, 20" x 1.75" SF steel. Tires - 20" x 1.75" gumwall. Color Finish - Light grey with bold yellow fork PSC. See the complete history of the Schwinn Scrambler. Frame/Fork - Schwinn, hi-ten steel. Handlebar - Steel, BMX bar. Stem - MX 750 double clamp with alloy top. Crank - Heat treated 6 1/2" with 43T steel sprocket. Rims/Hubs - steel 7x type, 20" x 1.75" SF steel, chrome plated with shimano coaster. Tires - Predator gumwall 20" x 1.75". Saddle - Viscount, mini dominator. Seat post / clamp - Steel, chrome plated. Color Finish - Aquamarine PPH. Pedals - Plastic, two tone with chrome moly axle. Rims/Hubs - steel 7x type, 20" x 2.125" SF steel, with shimano coaster brake. Tires - Predator gumwall 20" x 2.125". Color Finish - Wild cherry PAS. Rims/Hubs - CMC HE2 steel 16" x 2.125" / SF, steel, chrome plate with shimano coaster brake. Tires - Predator gumwall 16" x 2.125". Color Finish - Intense blue PGG. Frame/Fork - Schwinn, hi-ten steel, girls style. Handlebar - Schwinn, mini-low profile freestyle design. Cranks - Heaet treated 5 1/2", with 43T freestyle disc sprocket. Pedals - Plastic, freestyle type, two tone with chrome moly axle. Rims/Hubs - CMC 7x type, 20" x 1.75" SF steel with shimano coaster brake. Tires - Freestyle gumwall 20" x 1.75". Saddle - Velo VL 123S with art design. Color Finish - Neon Rose PFG. Frame/Fork - Schwinn, hi-ten steel, girls design. Pedals - Plastic, two tone. Rims/Hubs - CMC HE2, steel 16" x 2.125" SF steel, chrome plated with shimano coaster brake. Color Finish - Lavender PGG. Yo! Accessories from Schwinn... way cool. Always wear a protective helmet, gloves and padded clothing when riding your BMX bicycle. Full cr-moly frames with unique Schwinn donut platform. Front sidewall and rear centerpull hand brakes. 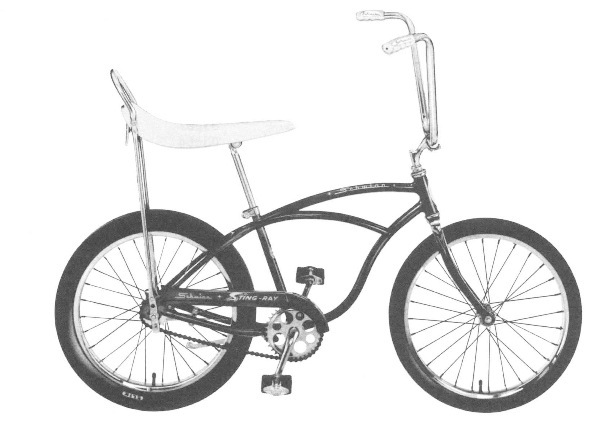 This site provides historical information about vintage Schwinn bicycles. We are Anna and Patrick Sexton. We created and coded this site together. Learn more about our site. We ♥ Schwinn, but this website is not affiliated with Schwinn. Looking for new Schwinn bikes? Please visit the Official Schwinn website. How much is my Schwinn worth? How to determine the collector value of Schwinn Bikes. I ♥ Schwinn, but this website is not affiliated with Schwinn.